Facing an early Saturday morning drive, and with little motivation to cook, it was decided that a trip to North Melbourne was in order. 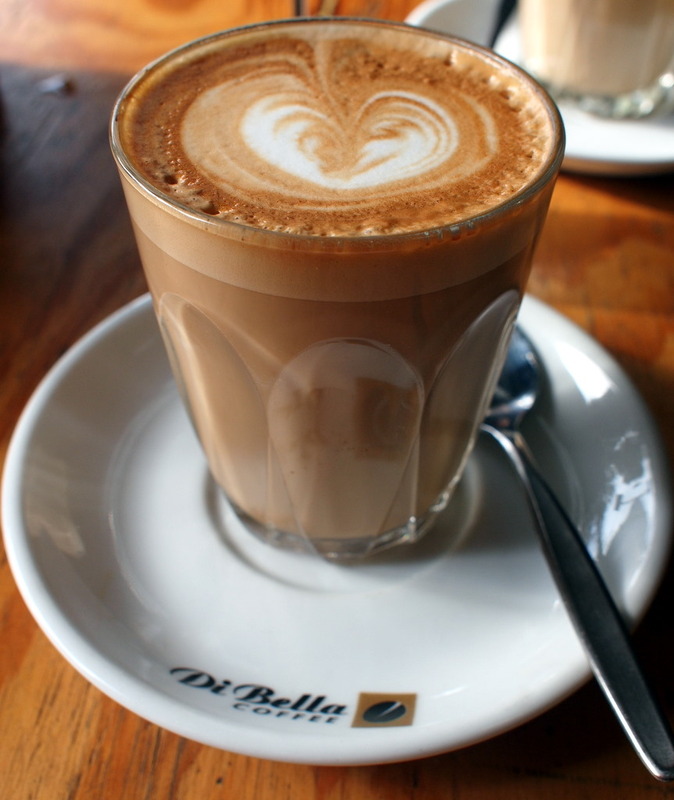 There's enough good cafes within a stone's throw of each other that deciding was the tricky part, but after realising that the coffee needed to be restocked at home, and that a good coffee really wouldn't go astray, we settled on the Di Bella Coffee Roasting Warehouse. The first thing you notice when you walk in is the variety of coffee beans available for sale. Being a roaster, this is of course hardly surprising. It was a beautiful morning so the cafe was opened up allowing a mixture of indoor and outdoor dining options. Settling at a table somewhat half-way between inside and outside, we ordered our coffees while perusing the tempting breakfast menu. You can tell that from the bubbles in the foam that the milk was actually a little burnt.Definitely disappointing considering that I've had pretty amazing coffee from this place before. You can't get things perfect every time I guess, but I had been really looking forward to my morning cup. Maybe I should stick to my usual order of a long black but I had wanted to mix things up a little. Thankfully, I had an amazing breakfast lined up. 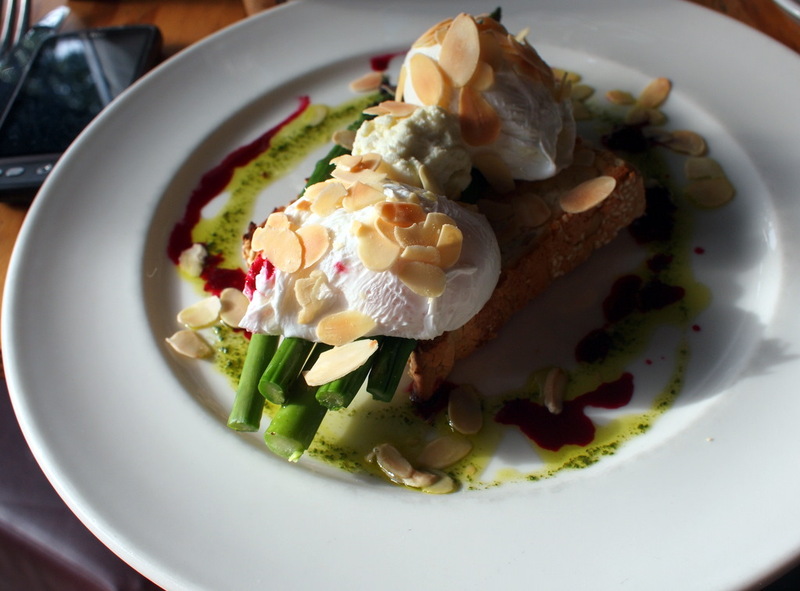 I'd ordered a serve of poached eggs with asparagus, fetta, almonds, truffle oil and beetroot relish and was pretty impressed when it arrived. 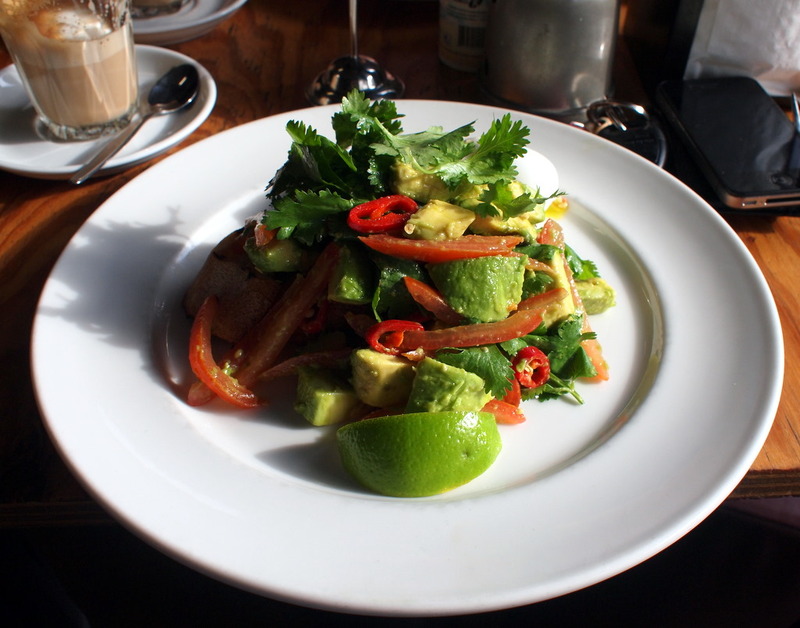 My companion ordered a similarly tasty dish of poached eggs with avocado, tomato, coriander and chilli. He certainly enjoyed his meal and polished it off rather quickly. The Asian inspiration lent an interesting twist to the traditional breakfast of poached eggs. I've had nothing but brilliant experiences with the food here (the desserts aren't bad either) and this is the first time that my coffee hasn't been amazing. There's nothing stopping me from coming back to this happy little cafe with fast, friendly service to boot. Here's to more indulgent weekend breakfasts. Apologies if I was mistaken. Can't wait for next time!